There is a coffee shop that I love to visit whenever I meet up with my sister. They have the best Cheeseburger Chowder soup. I didn't know what to expect the first time that I ordered it, but I knew it pretty much had to be wonderful. Of course I had to order it in a bread bowl, because c'mon...is there really any other way to eat a soup when you are eating out? I have been trying to replicate the recipe for a few years and nothing seemed to come as close as I would like it to be. That is, until over Christmas break I decided to just start from scratch and make up my own as I went. That's where this bowl of deliciousness comes in. I knew I wanted really cheesy and really full of flavor. I added some celery salt just because I thought it gave it a bit of flavor without being too salty or too celeryish. I hooked it up with the Velveeta cheese. I mean, I know it "technically" isn't cheese per say. But holy moly, it melts into a wonderful cheesy concoction that makes wonderful dip, so why not soup? You could of course cut it back I'm sure, or substitute real cheese. Do whatever floats your boat. I also shredded my own spuds for this recipe. I think that's where all my recipes were failing me before. Using frozen hashbrowns is always what I had done, but they always got kind of mushy and I don't really care for mushy. I feel like shredding my own potatoes kept them a bit hardier. It could just be a figment of my over-imaginative brain. All I know is that it tasted wonderful. I also served them in a bread bowl. Because as I mentioned above, there simply isn't another way. I mean, yeah - you could use a regular ol' bowl. There is no fun in that though. 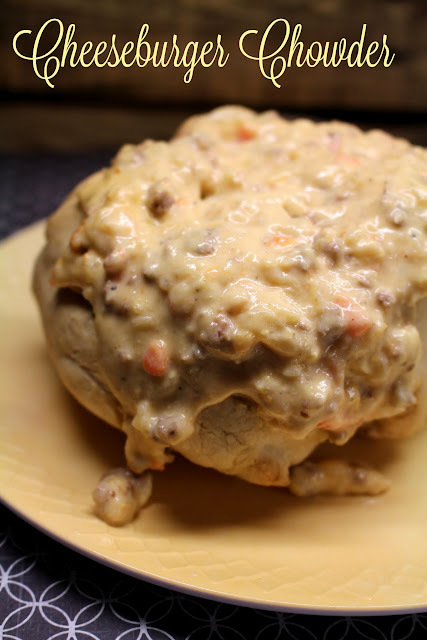 I am not going to pretend that I magically came up with a bread bowl recipe, because I did not...so you can visit this blog right here and follow the same recipe that I did. It makes four bowls, and they taste pretty much spectacular. Brown 1 lb. ground beef; drain and add to the broth mixture. Then whisk in the milk and cook until thick and bubbly. Mix well and let cook for another 30 min or until it all melts. Serve with warm bread or in a bread bowl.